To day we are helping celebrate the release of the squishiest cutest novella I know -- Taming Fate by Amallia Dillin!! Now, Amalia is a great friend of mine so obvs I think she is amazing, but other people on book places have also praised this novella including scired77 who said: "I highly recommend Taming Fate. The story is intriguing, the writing is masterful, and I loved every word." Taming Fate is a novella, meant to accompany the Fate of the Gods series, about Eve who has many lives and stories that seem intertwined with the DeLeon family throughout history -- this one in particular is with Ryam DeLeon in 15th century France. Eve is "absolutely" somebody's favourite character according to amazon, and I love her too, so we get to talk to her today in an EXCLUSIVE (idk if it really is) ONE TIME ONLY (again, I think I made this part up) INTERVIEW (this is the only factual part of this sentence). The rough amount of squishy cute we are talking about in Taming Fate. VERY. Welcome Eve! So in your 15th century life in France you married the Marquis (Ryam DeLeon). In the beginning, how would you characterise your relationship with him? Our relationship was difficult, to say the least. He was overbearing, arrogant, and frustratingly paranoid on any number of subjects! But his expectations were the most aggravating part. He may have known I was Eve, but he didn't understand what it meant, how it made me different. He wanted a dutiful wife, meek and obedient. Innocent. I thought... I thought he knew what he was getting, and I wanted so much to be myself, to be home, I didn't even consider -- didn't want to consider, perhaps -- that he might be put-off by the truth of my character. I suppose we both had problematic expectations, when it came down to it. You have many lives, all of them interesting, but this one feels special somehow. Do you see it as just another life or was it something different for you too? Every life when I can return home is special to me. Being part of my family, being able to be myself, living just one life without lies, after so many lifetimes hiding inside my own heart and mind -- I can't begin to describe how precious those moments are to me. It's so rare. Rarer than even real, true love. You mention Ryam quite a lot in the Fate of the Gods series, what makes him so special? Ryam knew me. Not at first, truly, the way I might have hoped -- the way I expected after the circumstances of his arrival -- but later. He knew me, and he loved me as myself. I didn't understand at first why he'd insisted on our marriage. I thought it was just his pride. I was so wrong. Maybe that's what made Ryam so special, in the end. He surprised me. In so many ways. Do you envy the Gods their ability to not have to live and interact in the world? It seems like sometimes you get the raw end of the deal because you have their longevity, and in some ways their burdens, but are forced to endure lives that are full of risk and difficult decisions. ...I'm not sure what gods you're talking about, unless you mean the Archangels and their parlor tricks. I know Adam tried to make himself a god, and maybe he succeeded through time and legend, a time or two. But to answer the heart of your question, I'm not sure what I'd do with myself if I didn't live as I do. What would be the point of my life? my lives? I'm meant to love, to nurture my people, to serve the world, and how in Creation would I accomplish that, if I didn't live within it? How do you keep on trusting and loving in the face of the hardest of circumstances? It just seems like the only way out, sometimes. The only gift I can give to the people around me and the only choice worth making. Even if I couldn't do much else, I could still do that much. And it seemed the best way to honor God, and Reu. Even Theseus and Thorgrim and Ryam, too. They made so many sacrifices for me, with so much less, and I owed them and their memories at least this much, in return. REAL TALK: are fleas actually the worst?Fleas are a misery, but there are worse things, and for the most part, I've been able to avoid their association. Cedar and Lavender oils seem to repell them, and lemon juice and vinegar help to rid them from a body. I can't say I learned quickly how to subdue them, but I did learn. Really, the more offensive elements are the habits which allow fleas to take up residence upon people in the first place. Filth is far, far worse than fleas! And more dangerous, generally, as well. What is 15th century Christmas like?In France it was celebrated with a midnight mass, followed directly by an incredible feast, to break weeks of fasting. The following twelve days were full of more of the same for the upper classes, with nativity plays and fine meals. All of this came at the expense of the servants, of course. But on Epiphany, the servants celebrated with us, and everyone was given a slice of Kings' cake. Whoever found the bean (or if the Lord of the Manor was particularly generous, as Ryam was, sometimes a gold coin was substituted) became king or queen for the day. I'm convinced Ryam rigged it somehow, because I can't remember a Christmas when anyone but a child discovered the prize. Epiphany was always my favorite of the Twelve Days, in spite of the mass. Does the memory of Ryam DeLeon fade with time, for you, or stay strong? Why?I wish I could say that I remembered him as clearly today as if he stood beside me, but he is certainly one of my more memorable husbands. It helps to have his journal. I can hardly read two pages without remembering some small moment we spent together, prodded back to the surface by some off-handed phrase or description. And it helps even more to be among his family again, my family. Both Garrit and his father have a lot of Ryam in them. As for why, it's as I said before -- it was rare to find love and freedom in the same lifetime. Ryam gave me that gift, and even if I can't remember all the details of it, I'll always remember his love. 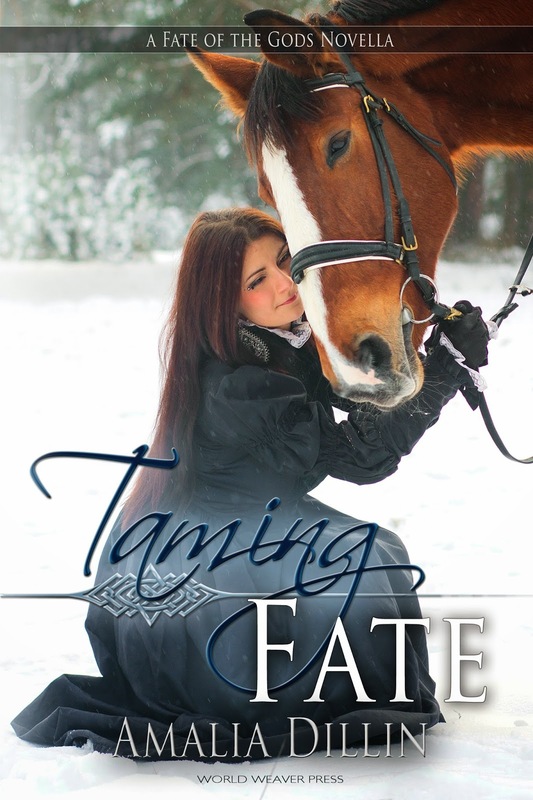 Where can we read Taming Fate?I'm told Taming Fate is available in paper and digital editions (though I can't imagine why anyone would want anything other than a paper book!) from Amazon and Barnes and Noble, among other booksellers. You know, the internet happened so suddenly, sometimes it leaves me reeling, still, even if I did grow up using it! It's like flight, in that way. One moment there's a rumor of two men and an immense glider, floating through the sky, the next there were wars being fought over our heads, and a heartbeat later, we were walking upon the moon! Thank you Eve! What do you guys think of this squishy cute novella? 15th century christmas sounds fabulous, no? Amalia Dillin began as a Biology major before taking Latin and falling in love with old heroes and older gods. After that, she couldn't stop writing about them, with the occasional break for more contemporary subjects. She lives in upstate New York with her husband, and dreams of the day when she will own goats — to pull her chariot through the sky, of course.